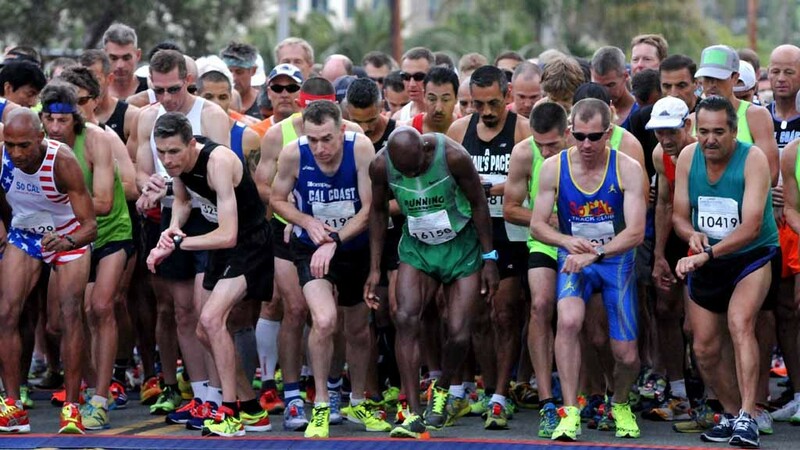 Competitors start the masters men's race — age 40 and up. 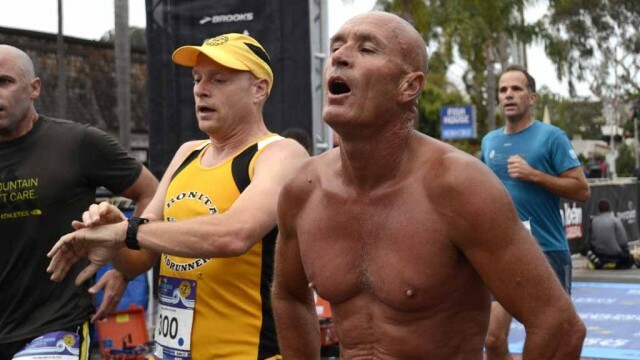 Two exhausted runners pause after completing the masters men's race. 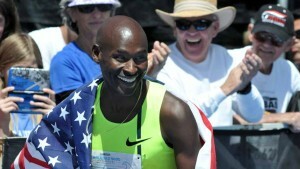 Bernard Lagat of Tucson was a crowd favorite after taking third (as top American) in the elite men's race. 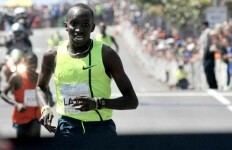 Lawi Lalang displays a Kenyan flag at the medal ceremony after winning the elite men's race. 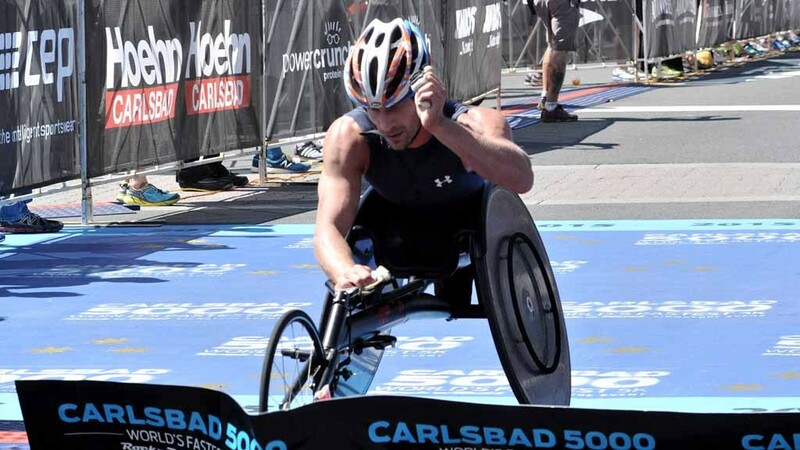 Josh George wins the wheelchair race in 10:34. Mary Ryzner of the San Diego Track Club reaches the finish line. 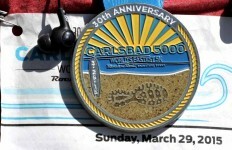 Competitors received a race commemorative medal. 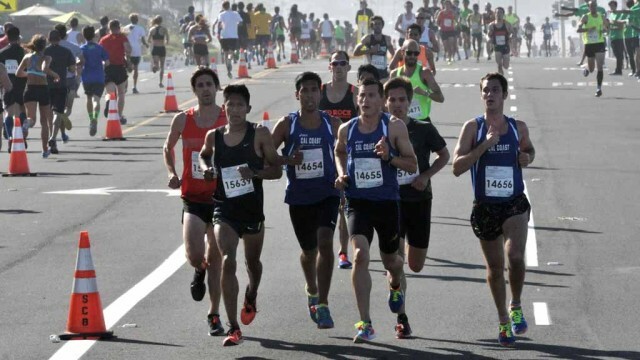 Leaders sprint run along the ocean in this men's and women's race, aged 29 and younger. 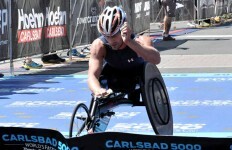 Wheelchair competitors start uphill on Carlsbad Village Drive. 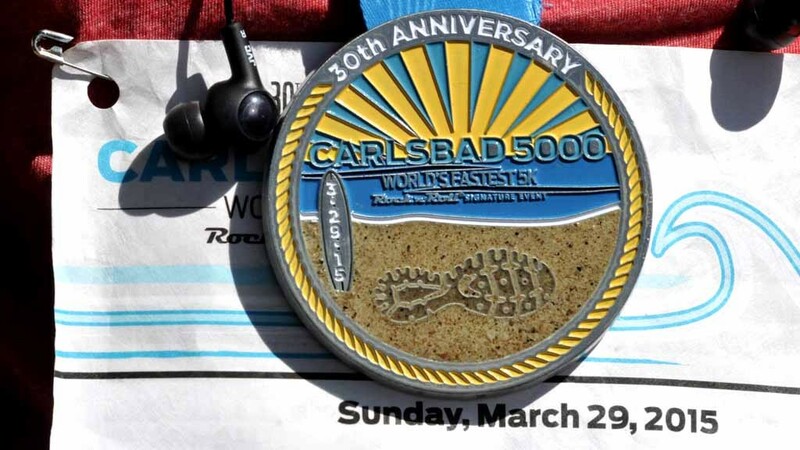 Thousandslined the race route to cheer on competitors at the 30th Carlsbad 5000. With help from a pace-setter, women start the elite race. Sunshine reflects in Cindy Abrami's sunglasses on a comfortable spring day. 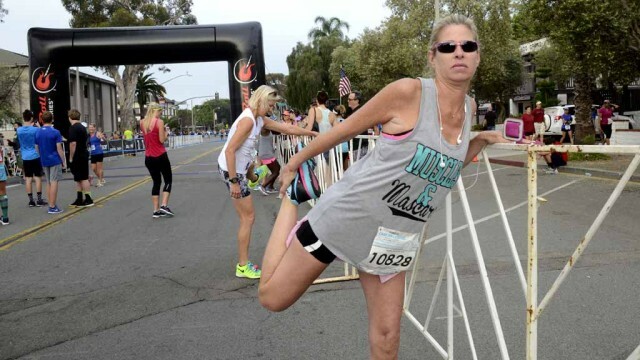 Lisa Contreras of Encinitas stretches out before the masters women's race. 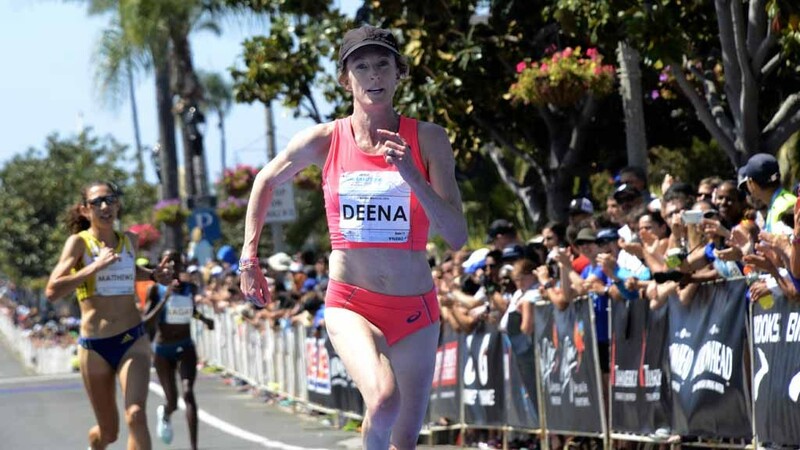 Tired runners finish the masters men's race, which started at 7 a.m.
Athens Olympic marathon medalist Deena Kastor 42, runs in the elite women's race. 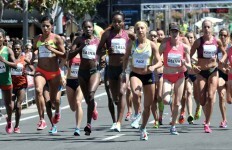 Marilyn Arsenault of British Columbia (16190) starts the leads the masters women's race among Janes club members. Young Roxy Kubler of Oceanside enjoys the beginning stretch with Heidi Kubler. 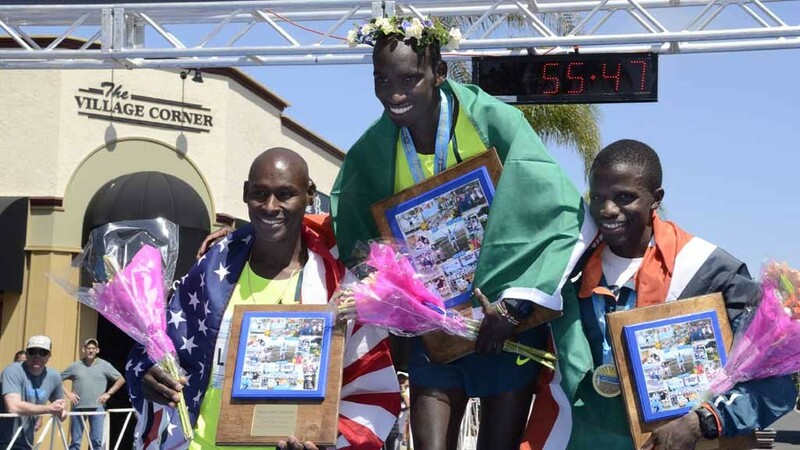 On the elite men's medal stand (from left): Bernard Lagat, winner Lawi Lalang and runner-up Wilson Too. On the 30-39 medal stand, Roosevelt Cook signals victory. 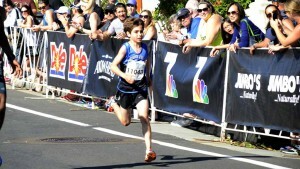 At left was runner-up Ryan Ripley of Henderson, Nevada. 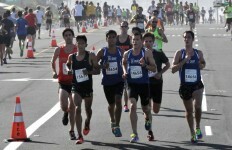 At right: third-placer James Lander of Fullerton. 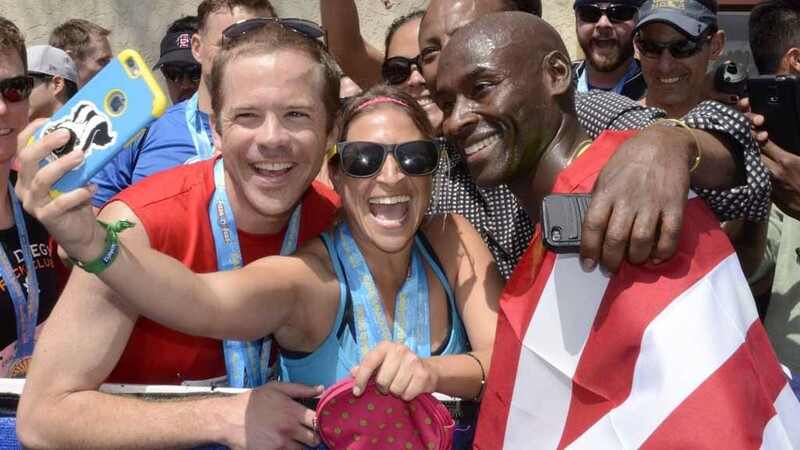 Bernard Lagat, wearing American flag, takes part in selfie action after taking third in the elite men's race. 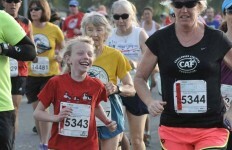 Marilyn Arsenault of Victoria, British Columbia, smiles as she wins the masters women's race in 17:30. 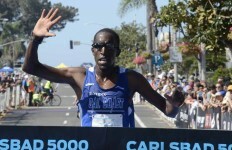 Roosevelt Cook of Oak Hills, California, wins the men's 30-39 race in 14:56. 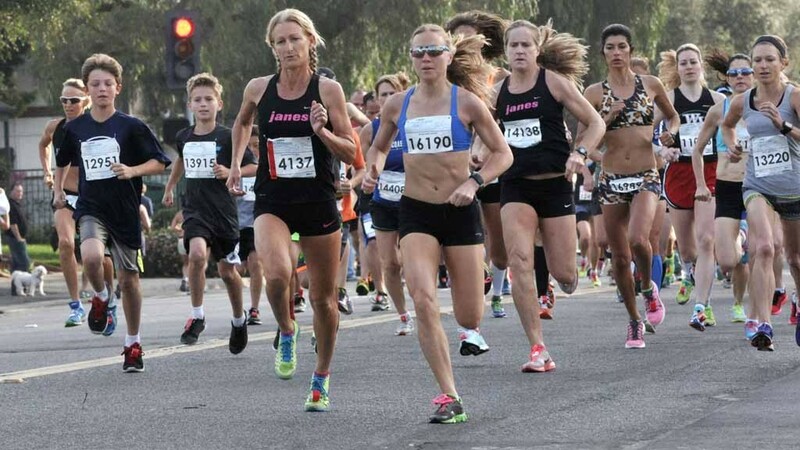 Jessica Textoris of Solana Beach wins the women's 30-39 race in 17:04. 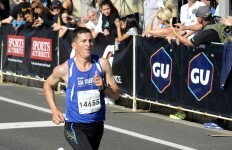 Running coach Greg Mitchell of McMinnville, Oregon, wins the masters men's race in 14:58. Jorge Jabaz of Anaheim wins the under-30 men's race in 14:45. 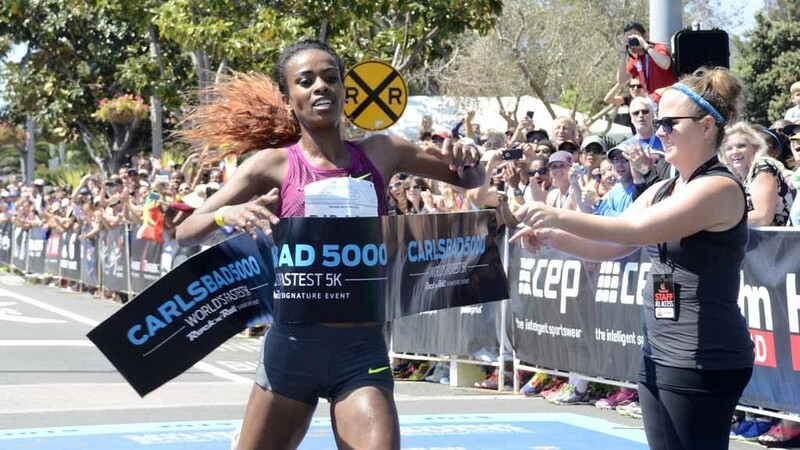 Ethiopia’s Genzebe Dibaba, continuing to emerge from the shadow of her Olympic champion sister, missed a world record at Sunday’s Carlsbad 5000 by only 2 seconds, winning her race in 14 minutes, 48 seconds. Despite crosswinds that hampered the elite men’s race — won by Kenya’s Lawi Lalang in 13:32 — Dibaba in her second road competition led after the pacer stepped aside, defeating runner-up Gelete Burka of Ethiopia by 25 seconds. “She didn’t have a problem with the wind,” said Dibaba’s translator (the owner of the Red Sea Restaurant in City Heights). 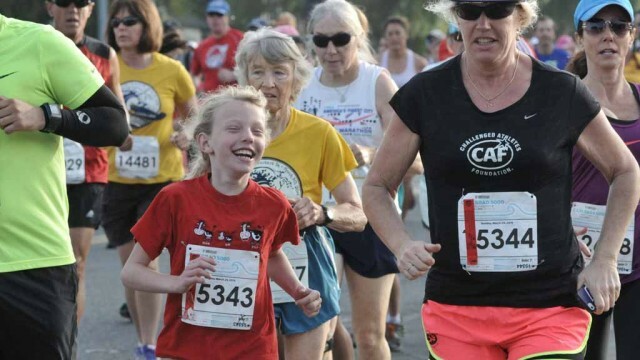 But she suggested she let the pace lag the first mile. 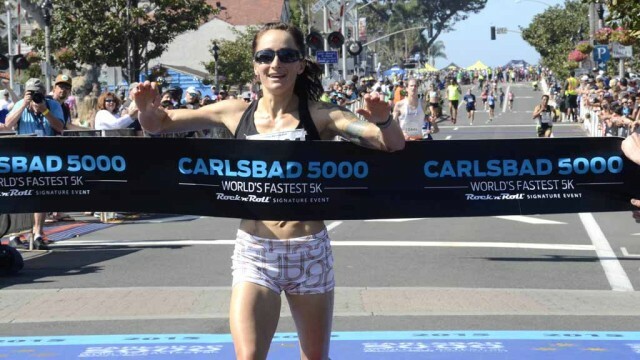 The world record thus stays with Meseret Defar — who ran 14:46 at Carlsbad in 2006. 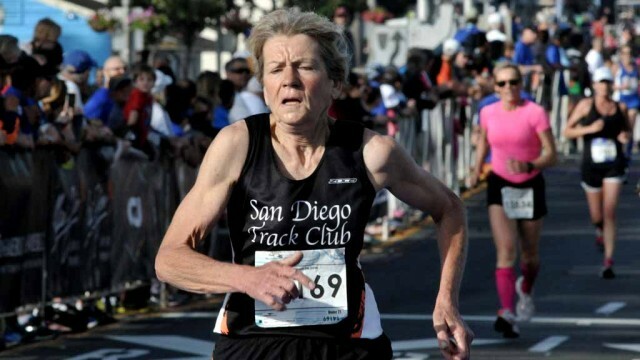 Longtime running analyst Toni Reavis, watching the race unfold from the press truck, blamed pacer Emily Lipari of the Boston Athletic Association. Olympian Bernard Lagat, the 40-year-old phenom, took third in a world masters record 13:40 — only 16 seconds off the American record of 13:24 he thought he broke at last year’s race. 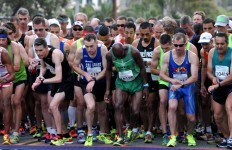 (The usual 3.1-mile course was found to be 13 feet short.) 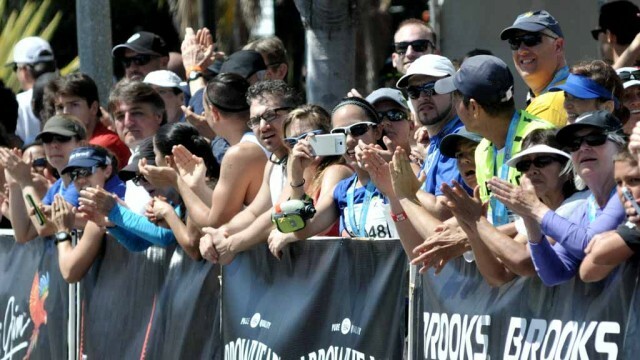 He took home a purse of $7,000 for being the first American finisher. Lagat, showing off his children and posing for pictures, didn’t fault the new “fan-friendly” two-lap elite course for his showing. 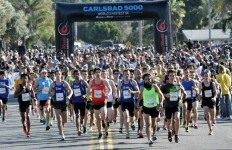 The new course has four U-turns instead of two used in the traditional route along coastal Carlsbad Boulevard. 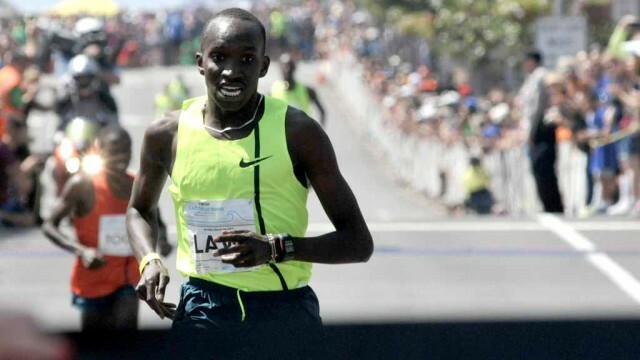 Winner Lalang, a 23-year-old who has trained with Lagat for more than four years, broke away from runner-up Wilson Too of Kenya after playing what race announcer and event director Tracy Sundlun called “mind games” at the start and even “trash talking” the day before the race. Lalang smiled at those stories but admitted only to putting psychology to his advantage. Whether the new course helped the elite runners is open to debate. 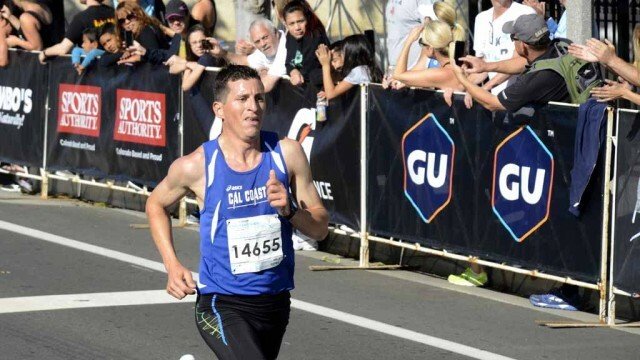 Sundlun had justified the change as a way of packing crowds closer to runners at the Grand Avenue start, which for 30 years has served as the downhill finish, as well as the oceanside part of the race. 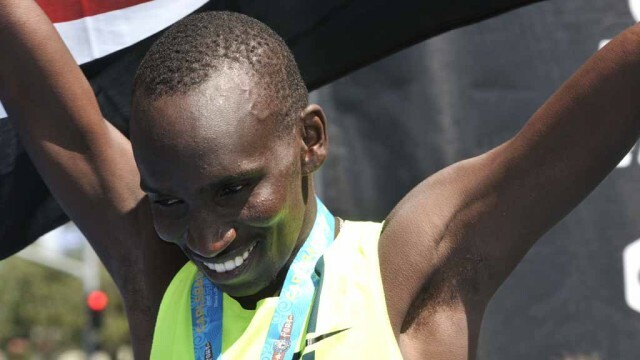 Almost as disappointing was the absence of four-time defending champion Dejen Gebremeske, the London Olympic silver medalist who withdrew so late that Lagat and others didn’t know he was out until just before the start. 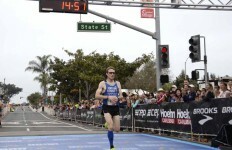 Elite athlete coordinator Matt Turnbull told Times of San Diego that Gebremeske, known as “DJ,” felt sick after his last training session Wednesday in Addis Ababa, the Ethiopian capital, and opted not to fly to California that night. 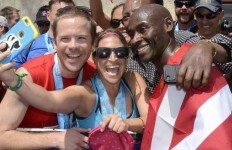 Bernard Lagat of Tucson receives a lot of attention from the crowd after the Elite Men’s race in which he finished third. In other races, 41-year-old Greg Mitchell of McMinnville, Oregon, dominated the first race of the day — the men’s masters race that started at 7 a.m. in cool and windless conditions. 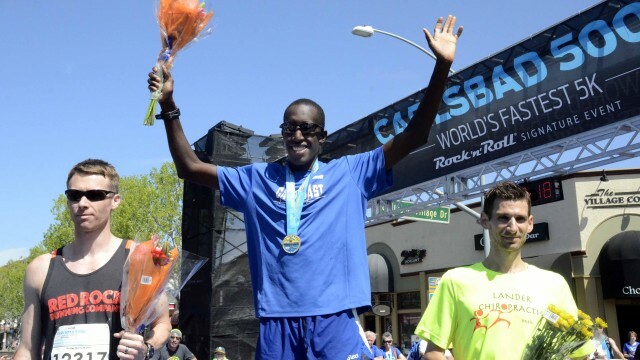 An assistant track coach at Linfield College, he finished in 14:58, less than 10 seconds off his all-time best. 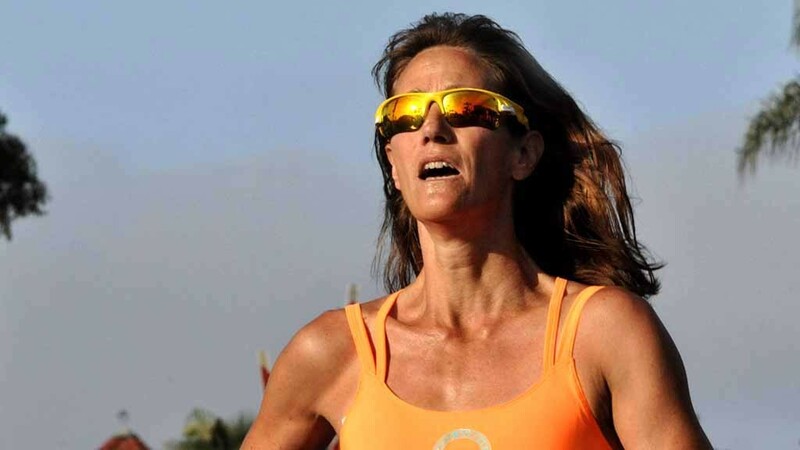 Marilyn Arsenault, 47, of Victoria, British Columbia, won the masters women’s race in 17:30 — 22 seconds ahead of 2008 Olympic triathlete Julie Ertel (who as Julie Swail won a silver medal in water polo at the 2000 Summer Games). 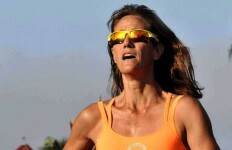 Arsenault, who also won the 2010 masters women’s race (in 17:16), said she took up racing at age 35. 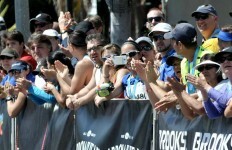 She now trains other runners. 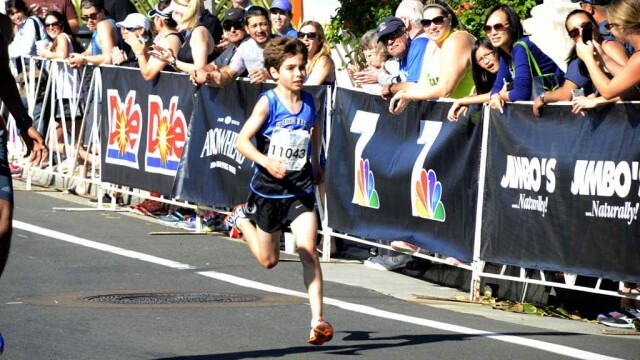 Also notable among Sunday’s 10,000 entrants was Phoenix’s Xander Black, 12, and Oceanside’s Anne Garrett, 80 — who both broke listed age or age-group world records. 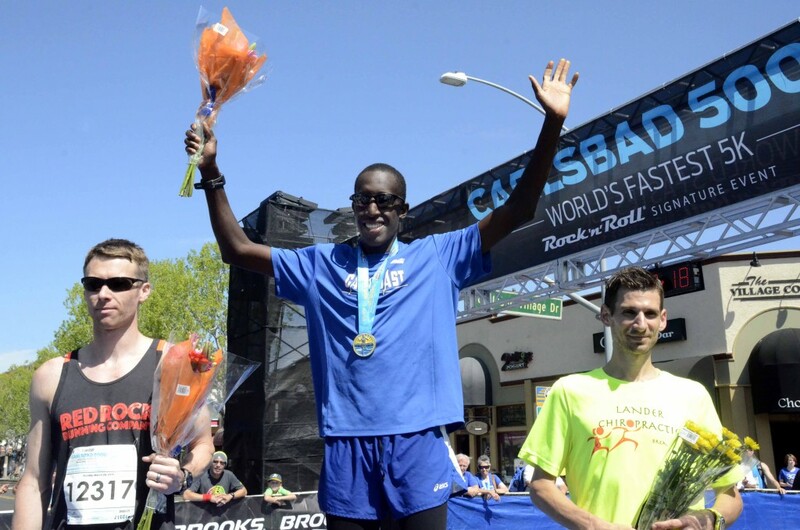 Xander clocked 16:47 to beat the listed age-12 record of 17:22 by Nathan Davis in 2013, and Garrett finished in 28:37 to set an age group (80-84) world record, crushing the listed mark of 29:41 by Canada’s Lenore Montgomery at Carlsbad in 2011. Van Sickle said Xander has run 16:45 on a certified 5K course. Jorge Jabaz of Anaheim won the 29-and-under race in 14:45, and Kristin Johansen of Longmont, Colorado, took the women’s race in 17:08. 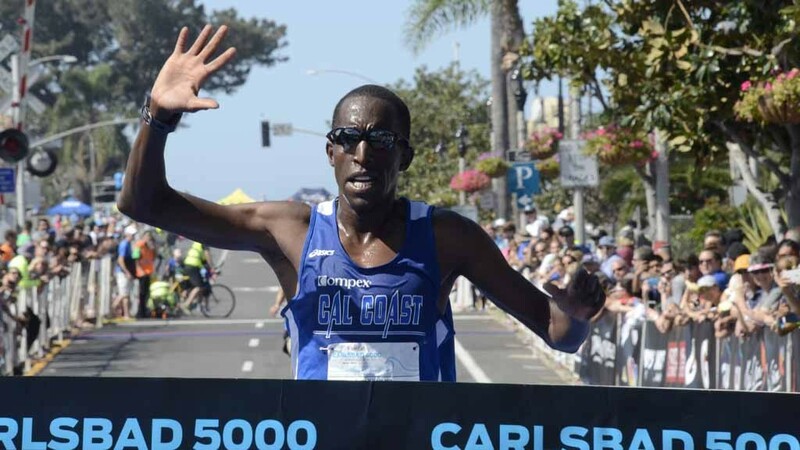 The men’s 30-39 race went to Roosevelt Cook of Oak Hills in 14:56, and the women were paced by Jessica Textoris of Solana Beach in 17:04. 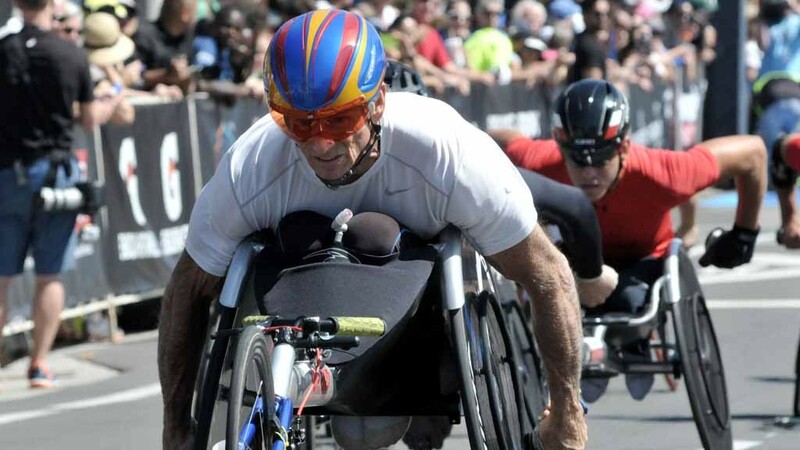 Paralympic legend Josh George, 31, edged fellow Champaign, Illinois, racer James Senbeta, 23, in the men’s wheelchair division, 10:34 to 10:36, while Boston Marathon winner Shirley Reilly, 23, of Tucson nipped Amanda McGrory, 28, of Savoy, Illinois, by a second — 12:17 to 12:18. Not as satisfied was 42-year-old Deena Kastor of Mammoth Lakes, the 2004 Olympic bronze medalist in the marathon. Now a mom (showing off her toddler daughter Piper at a Friday reception), Kastor took 12th in the elite women’s race in 16:05. 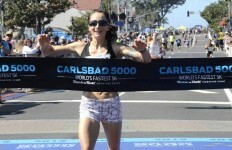 That was short of Colleen deReuck’s world masters record of 15:47.1 in 2004. 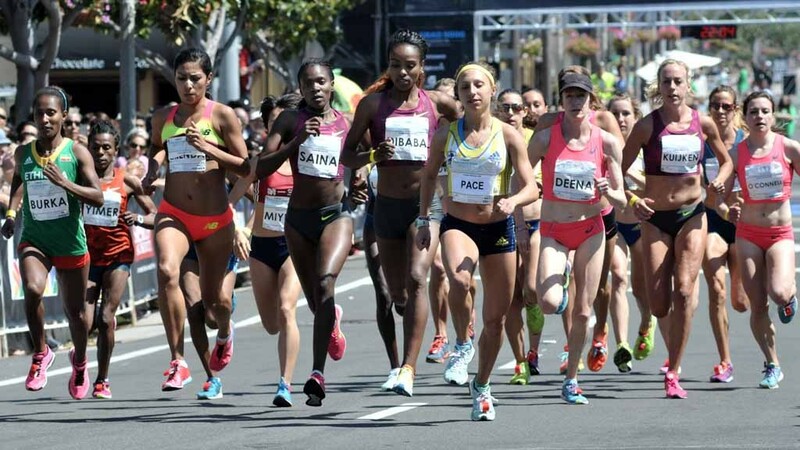 But Kastor’s time would have won the masters women’s race by almost 1 1/2 minutes. Going into Sunday’s event, Carlsbad had 16 world records and eight U.S. bests. 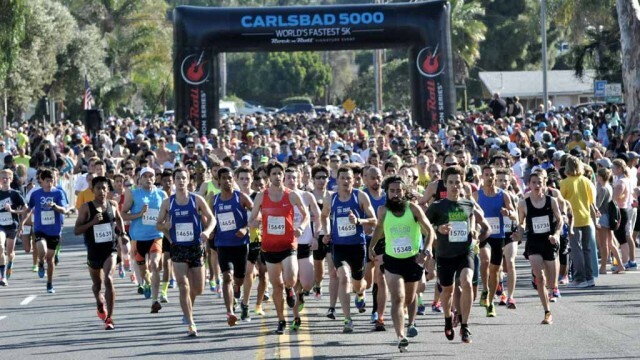 Of the top 50 5K road marks in history, 45 have been at Carlsbad. Dibaba is the younger sister of three-time Olympic gold medalist Tirunesh Dibaba, who gave birth to a boy Thursday. 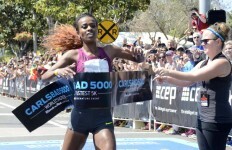 Genzebe began her assault on the record books Feb. 1, 2014, at Karlsruhe, Germany, winning an indoor 1500 meters in 3:55.17, chopping more than 3 seconds off the previous mark. 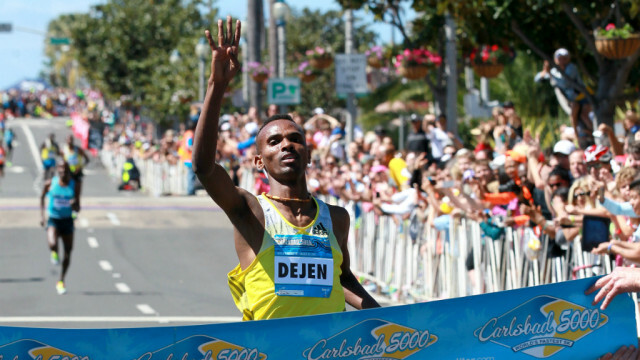 Five days later, at Stockholm, Sweden, Genzebe improved the world indoor record in the 3000 to 8:16.60, 30 seconds better than her personal best and more than 7 seconds quicker than the world mark. Then, on Feb. 15, at Birmingham, England, she set the world indoor two-mile record of 9:00:48 — 6 seconds faster than the old mark. 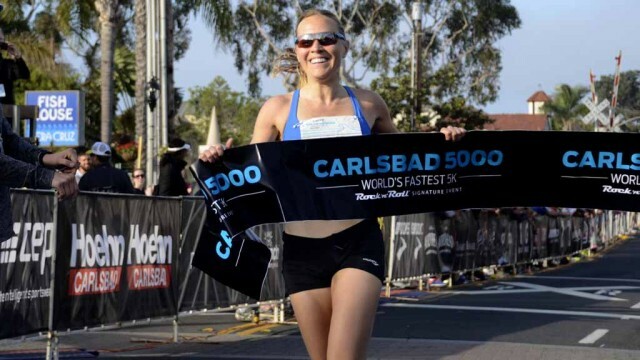 That made her only one of three athletes to set three world records in three different events in 15 days, joining Olympic greats Jesse Owens and Usain Bolt in that feat. And she is the only one to perform that feat in three different cities and meets and all in individual events. 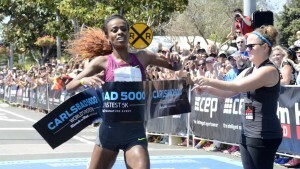 Five weeks ago, Genzebe gained her fourth world record, winning an indoor 5000 in 14:18.86 at Stockholm. 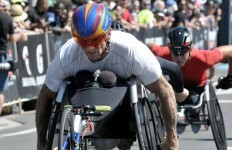 Competitors start the masters men’s race — age 40 and up. 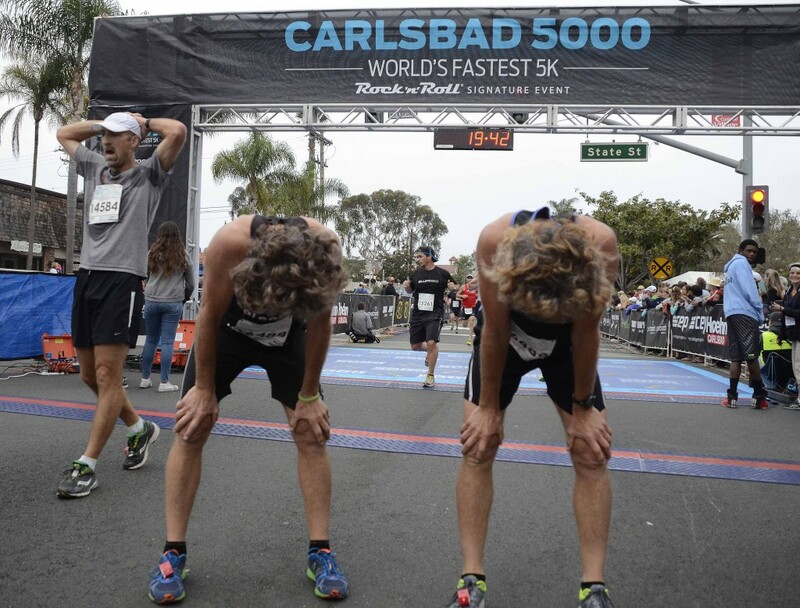 Two exhausted runners pause after completing the masters men’s race. 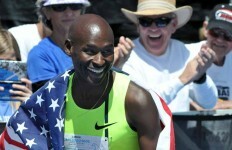 Bernard Lagat of Tucson was a crowd favorite after taking third (as top American) in the elite men’s race. 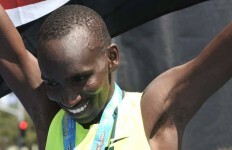 Lawi Lalang displays a Kenyan flag at the medal ceremony after winning the elite men’s race. Leaders sprint run along the ocean in this men’s and women’s race, aged 29 and younger. Sunshine reflects in Cindy Abrami’s sunglasses on a comfortable spring day. 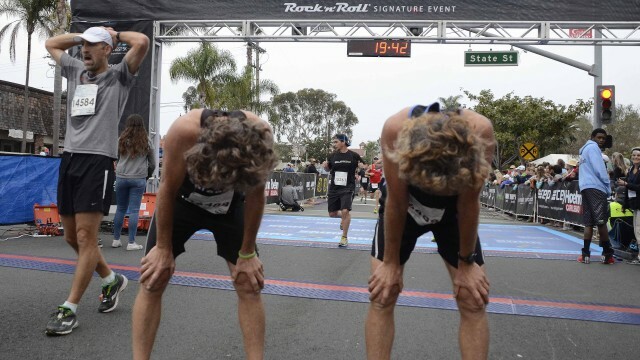 Tired runners finish the masters men’s race, which started at 7 a.m.
Lisa Contreras of Encinitas stretches out before the masters women’s race. 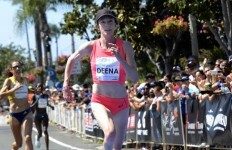 Athens Olympic marathon medalist Deena Kastor 42, runs in the elite women’s race. 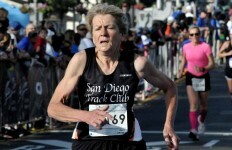 Marilyn Arsenault of British Columbia (16190) starts the leads the masters women’s race among Janes club members. 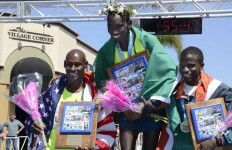 On the elite men’s medal stand (from left): Bernard Lagat, winner Lawi Lalang and runner-up Wilson Too. Bernard Lagat, wearing American flag, takes part in selfie action after taking third in the elite men’s race. Marilyn Arsenault of Victoria, British Columbia, smiles as she wins the masters women’s race in 17:30. 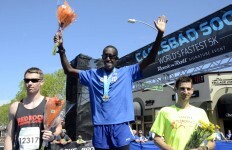 Roosevelt Cook of Oak Hills, California, wins the men’s 30-39 race in 14:56. Jessica Textoris of Solana Beach wins the women’s 30-39 race in 17:04. Jorge Jabaz of Anaheim wins the under-30 men’s race in 14:45. 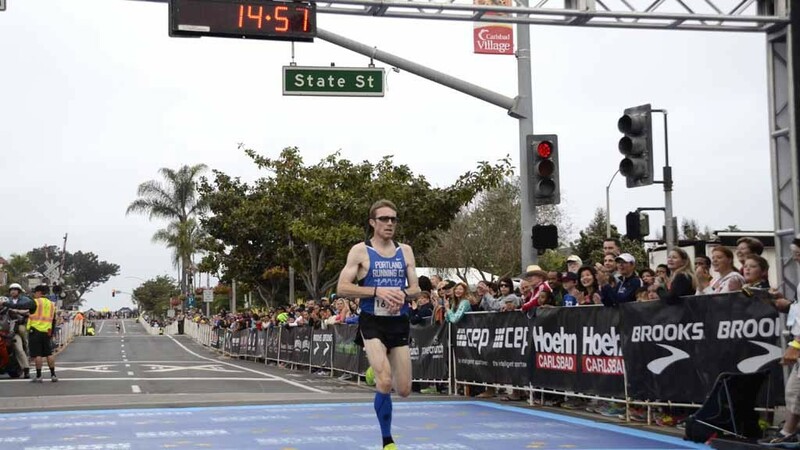 Running coach Greg Mitchell of McMinnville, Oregon, wins the masters men’s race in 14:58.